If you do not have a corporate presence in China it will not be possible to regster cn and com.cn domain names. To allow our clients a marketing presence in China we are now promoting cn.com as a temporary alternative to the .cn Chinese extension. Read our previous blog post on cn.com for more information http://blog.lexsynergy.com/2010/02/cn-dilemma.html. A two registration is £20.00. Labels: .cn, china, cnnic, com.cn. 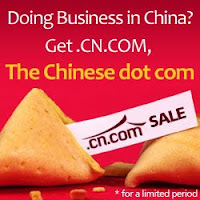 cn.com, domain names.